In 1997, NIDA published the first research-based guide on preventing drug use among children and adolescents. 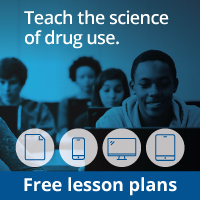 Using a question-and-answer format, this guide presents an overview of the research about the origins and pathways of drug abuse, the basic principles derived from effective drug abuse prevention research, and the application of these research findings. Key components of this publication are presented in the following images. The guide is available for viewing online.